Cheap hotel rooms are now available for booking and reservation. 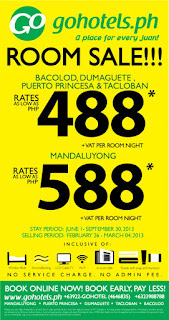 Gokongwei-owned low-cost hotel chain, Go Hotels announces a new room sale for the period of June 1 to September 30, 2013. 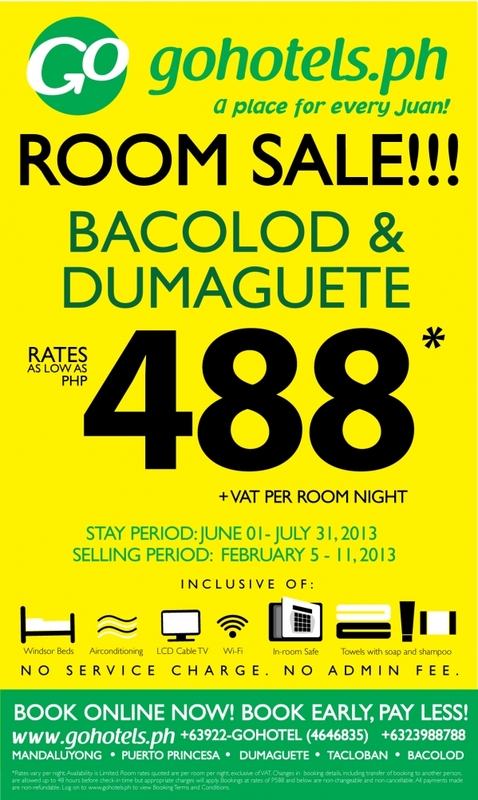 In this promo, the rooms were discounted to as low as 488 Pesos (exclusive of VAT) per night. The room rates are inclusive of all the basic services and amenities such as Beds, Aircon, TV, WiFi Access, Safe, Towels, Soap and Shampoo. Aside from value added tax (VAT), no other charges will be paid. Low-cost airline Cebu Pacific slashed down their fares for international destinations by as much as 50%. The announcement was made a day after they announced the 25 Pesos sale for domestic destinations. 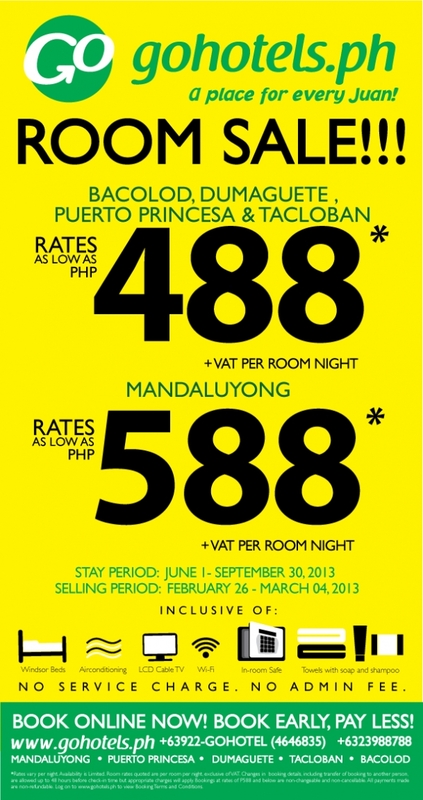 The travel period for this promo is from April 15 to June 30, 2013, just in time for the summer season. And among the popular international destinations includes Bangkok, Singapore, and Kuala Lumpur. Later this year though Cebu Pacific will start to fly to Dubai. Tickets can be purchased only at www.cebupacificair.com or at their ticketing office. Promo tickets are available until February 28 or until seats last, whichever comes first. For international flights, you need to be at the airport at least 2 hours before the estimated departure time (ETD). That will give enough time to finish the required procedure in the Immigration. To avoid inconveniences, please prepare beforehand your travel documents which includes but not limited to Passports, Plane Tickets, hotel reservations. Immigration officers in the airport has the final decision whether to allow you to go out of the country or not. In celebration of the 1986 EDSA Revolution today, the largest low-cost airline in the country, Cebu Pacific announces a 25-peso seat sale promo. The base fares of all domestic destinations were cut down to as low as 25 Pesos only. The travel period is from June 1 to September 30, 2013. Tickets can be purchased at Cebu Pacific's official website, www.cebupacificair.com. There are variety of options using their online booking facility. You can pay via credit card, ATM, debit card or reserve and pay later. You can also go to the nearest Cebu Pacific sales office and purchase the promo tickets there. The promo is until February 26, 2013 only or until seats last, whichever comes first. - Promo fares are non-refundable or rebookable. - Cebu Pacific reserves the right to make changes in flight schedules provided that they inform the affected passengers beforehand. - In cases such as above, the customer should be given several options that may include full refund of the ticket. - Domestic flight rule requires the passenger to get boarding passes 45 minutes before the estimated time of departure. Failure to do so may result in refusal of boarding. For only 27 Pesos base fare, you can travel in several domestic destinations on September 1 to November 30, 2013 travel period. This is the latest offer of the low-cost airline Airphil Express (formely known as Air Philippines). Tickets can be purchased online at www.airphilexpress.com or at the nearest Airphil Express sales office. For online purchases, you can either pay it using your credit card or through their reserve-pay-later option. In that option, you can reserve the ticket online and pay it later in any 7-Eleven Stores, M Lhuillier Pawnshops or selected Petron branches nationwide. The promo tickets are availble until February 28, 2013 only or until seats last, whichever comes first. - Please take note that the base fare does not include the fuel surcharge, taxes, service fee, and other miscellanoues charges. - Umbrellas, tripods and the like are not allowed inside the cabin, make sure to check-in these items before leaving the counter. - You must be at the check-in counter 45 minutes (domestic) before the estimated time of departure (ETD). 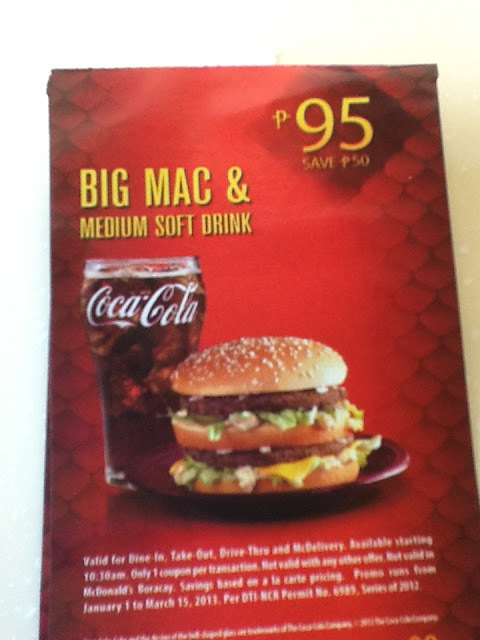 McDonald's Philippines is giving out discount coupons to their customers. With these coupons, you can get up to 50 Pesos discount on selected value meals at any McDonald's branch nationwide. The promo started last January 1 (sorry for the late report) until March 15, 2013. McDonald's Philippines is the second largest fast-food chain in the country. They sell chicken, rice meals, burgers, coffee and floats. McDonald's Philippines is operated by Alliance Global Group Inc, a publicly listed company in the Philippine Stock Exchange (PSE). Low-cost airlines Tiger Airways and SEAIR jointly launched another seat sale promo. This time, they slashed down the fares down by as much as 50%. All domestic and international flights coming from Manila are included in this deal. The travel period is from June 1 to August 31, 2013. For the complete list of fares and flights, please check Tiger Airways Fare Deals Page. Please take note though that the prices shown above refer only to the base fare. Additional payments for taxes, fuel surcharge and other miscellaneous fees are not included but will be paid when the ticket is purchased. Booking of tickets can be done online at www.tigerairways.com or at www.flyseair.com. For those who do not have a credit card for online booking, you can proceed to the nearest SEAIR-Tiger sales office and buy ticket in cash. 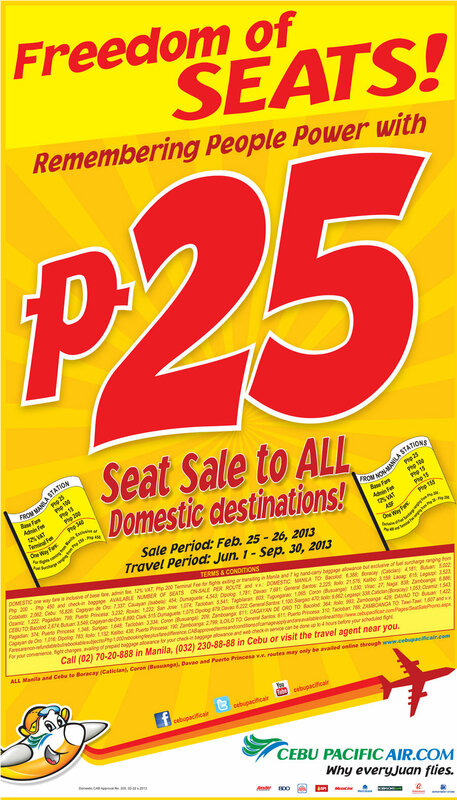 Booking of promo fares will be open until February 26, 2013 or until seats last. Airphil Exrpress Announces 388 Pesos Sale! A new set of cheap fares was announced by Airphil Express. The low cost airline has slashed down their fares down to as low as 388 Pesos only. 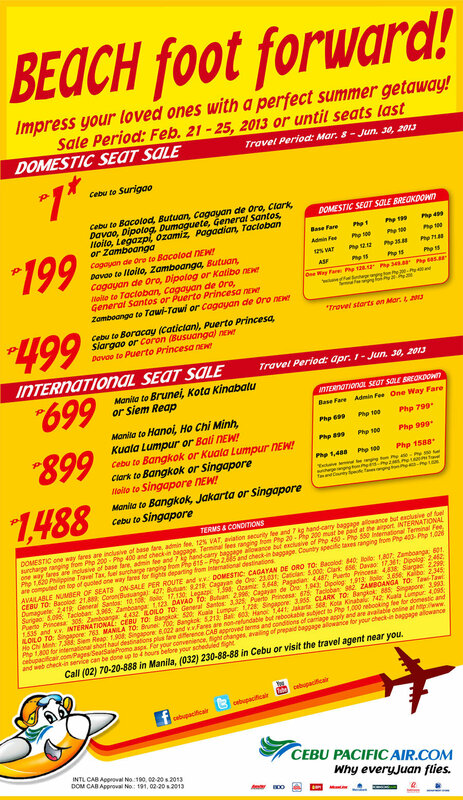 Manila to Luzon, and Cebu to Legazpi and Puerto Princesa were the routes included in this promo. The travel date for the promo tickets ranges from July 1 to September 30, 2013. Tickets can be purchased online at www.airphilexpress.com or at their ticketing offices. There are several payment options, one is credit card and the other is reserve and pay at any 7-Eleven Stores, M Lhuillier Pawnshops, and selected Petron gas stations. The promo can be availed until February 24, 2012 only or until tickets last. Please be reminded that the 388 Pesos is just for the base fare. Airlines imposes fuel surcharge that can amount to around 400 pesos. Then additional payment shall be charged for the admin/service fee, taxes, and security fee. Airphil Express gives 10 kilos of free baggage. In excess of that, additional charges will also be imposed to the passenger. Please take note also that the passenger should be at the check-in counters 45 minutes before the estimated time of departure (ETD). Failure to do so can result to denial of check. Please read the terms of service of the airline to avoid inconveniences along the way. Airphil Express, formerly known as Air Philippines is the low-cost arm of Philippine Airlines. It caters domestic inter-island flights as well as short haul regional flights to Singapore, Hong Kong and Kuala Lumpur, Malaysia. It is currently the third largest airline in the country after Cebu Pacific and Philippine Airlines. Low-cost airline Cebu Pacific announces a new piso fare promo as their introductory fare to their latest route: Cebu- Surigao. The piso fare will be available until February 25 or until promo seats last. Tickets can be purchased online at www.cebupacificair.com or at their ticketing offices. For online booking, you can choose a variety of payment options such as using credit card, ATM, and payment centers. Please take note that base fare tis exclusive of the fuel surcharge, baggage, terminal fee, admin fee, taxes and other miscellaneous charges. Please make sure to check the final amount to be paid before finalizing the purchase. As an added reminder, please read the terms of conditions document to avoid inconveniences. It can be found attached to your purchased tickets. Please take note that base fares does not include the fuel surcharge, security fee, terminal fee and other miscellaneous charges. Please make sure of the total amount of ticket before finalizing the transaction. Also, for your convenience, use the online check-in whenever possible. That service will save a lot of time. Tickets under this promo can be purchase online at www.cebupacificair.com or at their ticketing offices. For those who want to book online but has no credit card, Cebu Pacific have multiple options to pay such as ATM Card, debit card, or reserve and pay later. Just go ahead with the online booking process until those options come out. Tickets are available until February 18 only or until seats last, whichever comes first. For more suggestions, please check the website Trip Ko Blog! 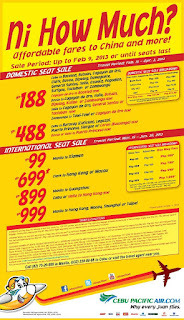 Low-cost airline tandem SEAIR- Tiger Airways announces a new deal: buy one take one tickets for all their current domestic destinations. The lowest fare for two is around 899 Pesos only. That's 450 Pesos base fare for each person. 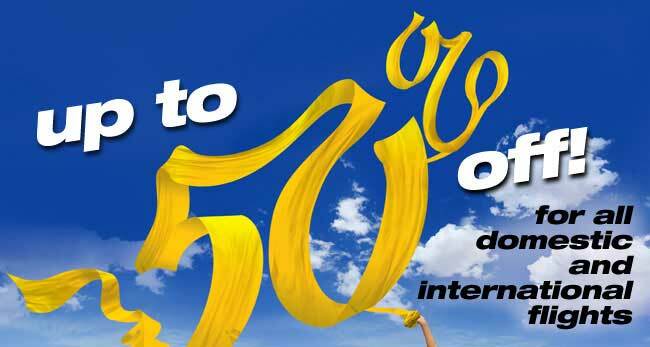 The promo is for those traveling from June 15 to October 10, 2013. Tickets can be purchased either at www.flyseair.com or at www.tigerairways.com. You can also purchase tickets at their ticketing offices. Tickets are available for purchase until February 14, 2013 only or until seats last (whichever comes first). Here's the latest promo from budget airline Airphil Express. They are offering Cebu-Mindanao flights a discount, bringing down the airfares down to as low as 188 Pesos. For Manila to Mindanao routes, the fares were cut down to as low as 688 Pesos. Among Airphil's Mindanao destinations are Cagayan de Oro, Davao City, Ozamiz and Cotabato. Tickets can be purchased online at www.airphilexpress.com or at their ticketing offices. If you don't have a credit card, you can still book online. Airphil now offers reserve now and pay later scheme. You can reserve online, then pay it in cash at the nearest 7-Eleven convenience store, M Lhulillier branch or at selected Petron branches. This promo is for the travel period of June 1 to August 31, 2013. Promo tickets are available until February 14, 2013 or until seats last, whichever comes first. This promo is part of regular promotions of Airphil Express. Please take note that the 188 Pesos and the 688 Pesos mentioned above refer only to the base fares. It is exclusive other fees such as the fuel surcharge which could amount to more than 400 Pesos, taxes, terminal fee, and other miscellaneous charges. To avoid inconvenience, always check the final amount before the final purchase. Don't know where to go? Please visit the blog Trip Ko! For ideas about places to go. 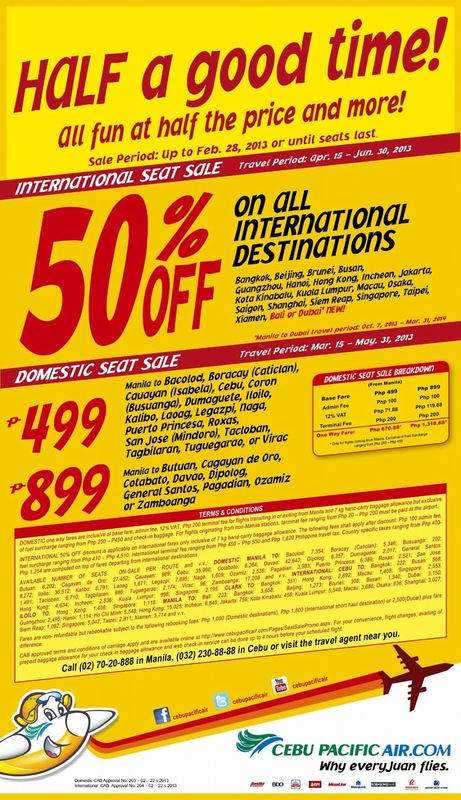 Budget carrier Cebu Pacific announces a new seat sale promo for selected domestic and international destinations. 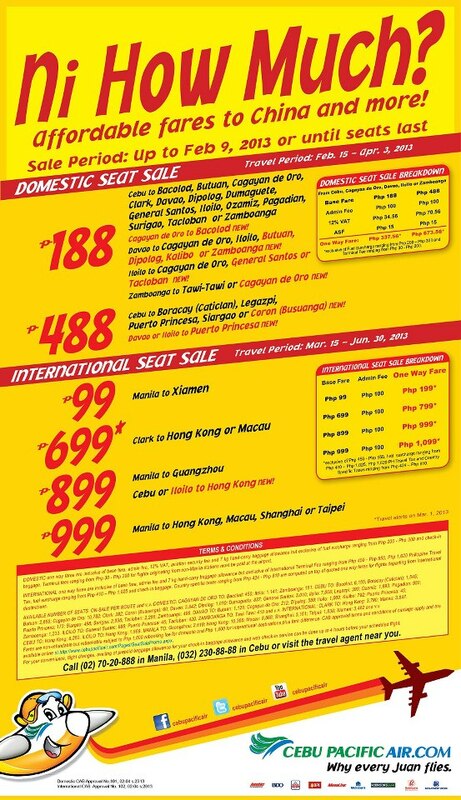 This new seat sale promo is for the celebration of the Chinese New Year 2013. Major Manila- Luzon, Manila - Visayas, and Manila - Mindanao are among the domestic routes included in this promo. For international, Manila to Dubai and Korea were included. The travel period for for this promo is from February 15 to April 3, 2013 (domestic) and April 1 to June 3, 2013 (international, except Dubai, which will start October 7). Tickets can be purchased at www.cebupacificair.com or at their ticketing offices. You can also contact Cebu Pacific at the following contact numbers: (02)7020888 (Manila) and (032)2308888 (Manila). Tickets are available until February 12, 2013 or until seats last. Cebu Pacific allows up to 7 kilos of hand-carried baggage. Make sure to use this up. If you can compress your baggage below 7 kilos, then do it. You will save a lot of time by avoiding the waiting time for your baggage to come out to the conveyor. 1. Cebu Pacific also offers online check-in. You can check-in 2 hours before your estimated time of departure (ETD) and just deliver your baggage at the counter 15 minutes before ETD. 2. Do not include umbrella, tripod and similar items in your hand-carried bags. You will be not be allowed to pass the final security check. If you need them, deposit it to the check-in counter. Cebu Pacific is the largest airline in the country. They flew over 13 Million passengers last year. They currently operate at 33 domestic and 20 international destinations. Seair - Tiger Airways team-up launches another promo today. They are giving out discounted seats in selected domestic and international routes. For domestic, they have slashed down the base fares down to as low as 88 Pesos. For international, they have slashed it down to as low as 888 Pesos. The travel period is from July 1 to November 30, 2013. Tickets can be purchased only at www.tigerairways.com or at www.flyseair.com. You can also buy it from their ticketing offices. Promo tickets can be purchased until February 10, 2013 only or until seats last, whichever comes first. SEAIR-Tiger Airways flies to Bacolod, Iloilo, Puerto Princesa, Davao, Kalibo, Tacloban, and Cebu. On the other hand, international destinations are many including Singapore, Hong Kong, Bangkok and Jakarta. They are currently operating on Clark and Manila hubs. 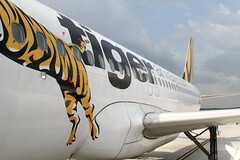 Singaporean budget airline Tiger Airways bought 40% stake in the local airline South East Asian Ailines (SEAIR) in 2010. Since then, the tandem has been very aggressive in expanding their services in the country. They have launched new routes, leased new planes, and increased the number of flights. They are directly competing against Cebu Pacific, Airphil Express, Zest Air, and Air Asia. 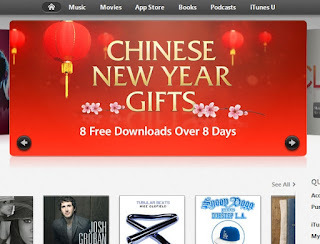 As a holiday treat for the Chinese New Year, iTunes Store is having a promo. They are giving free downloads of Apps, Music and Movies for the period of 8 days. The promo starts today and will end February 15, 2013. Today's freebies are songs from Taiwanese singer, Rainie Yan. Two audio and one video files are available for download at the iTunes Music Store. 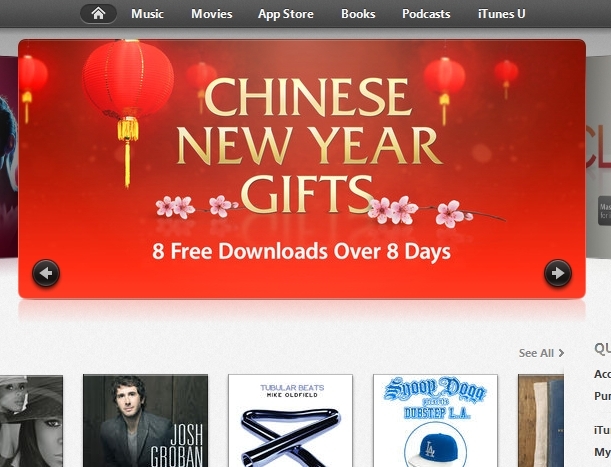 Last December, iTunes Store held a promo for the Christmas Holidays. They gave a number of Apps, Music, and Videos for a period of 12 days. Back then though, you need to download the Holiday App. 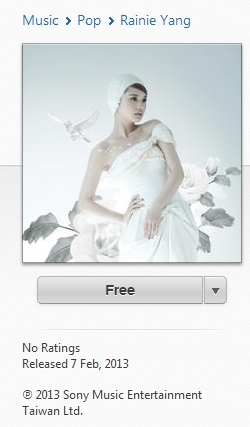 But in this promo, you can download directly from the iTunes Store. To download, just click this link and it will take open your iTunes in your computer. Sign-in using your Apple ID and click your the file that you want to download. Or you can open up your iTunes and go to the iTunes Store Home. iTunes Store is the portal to Apple's online services which includes Music, Books, Podcast and Apps. iTunes boasts the biggest collection of songs. movies, and books from leading providers. iTunes Store is operated by Apple Inc, the maker of iPhone, iPad, Macs and other computer products and peripherals. 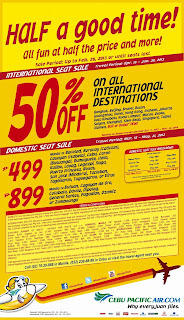 Low-cost airline Airphil Express announces a new seat sale promo: International Websale. This latest deal offers as low as 888 Pesos of base fare on selected Airphil international destinations: Hong Kong, Kuala Lumpur, and Singapore. If you have travel plans to those destinations, please read more details below. The travel date for the promo is from February 20 to June 15, 2013. Tickets can be purchased at www.airphilexpress.com or through their ticketing office. For online bookers without credit card, you can have it reserved and then pay later on at any 7-Eleven stores, M Lhuillier outlets, and selected Petron stations. 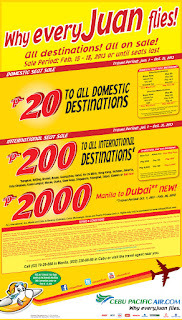 Promo period is until February 10, 2012 or until seats last, whichever comes first. Again, please be reminded that promo fares are non-refundable and non-rebookable, except on cancelled flights such as when there's a bad weather. With that, always make sure of the travel date. Also, the 888 Pesos is just for the base fare. It is exclusive of fuel surcharge, taxes, extra baggage, terminal fee and other miscellaneous charges. Make sure to review the breakdown of the charges before finalizing the transaction. Please read the terms and conditions documents to avoid inconvenience. Make sure to purchase enough baggage allowance early on to avoid the high cost of baggage addition. Also, please take note that for international travelers, you need to be at the check-in counter at minimum of 2 hours before the estimated time of departure (ETD). The extra time will be used in processing your clearance to the immigration authorities. Failure to secure clearance from the Immigration before the actual fly time is deemed forfeiture of the purchased ticket. Airphil Express is the budget arm of Philippine Airlines. It operates domestic and selected short haul regional flights. Both Airphil Express and Philippine Airlines are operated by San Miguel Corporation. Budget carrier Cebu Pacific announces a new seat sale promo which gives as low as 99 Pesos base fare. Both domestic and international destinations were included. The 99 Pesos base fare is for those traveling from Manila to Xiamen in mainland China. On the domestic, the low-cost carrier cuts down the base fares down to as low as 188 Pesos on selected routes. Among the destinations included are Bacolod, Dumaguete, Tacloban, Davao, Clark and many more. The complete list of destinations can be found at the picture below. The travel period for this promo are February 15 to April 3, 2013 for domestic flights and March 15 to June 30, 2013 for international flights. 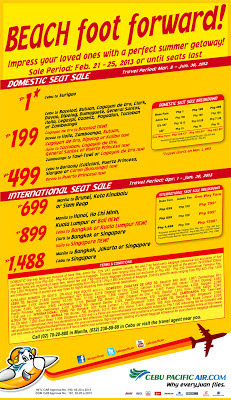 You can purchase Cebu Pacific tickets online at www.cebupacificair.com or at their ticketing offices. Payment options includes credit card, ATM cards, reserve and pay later, and others. 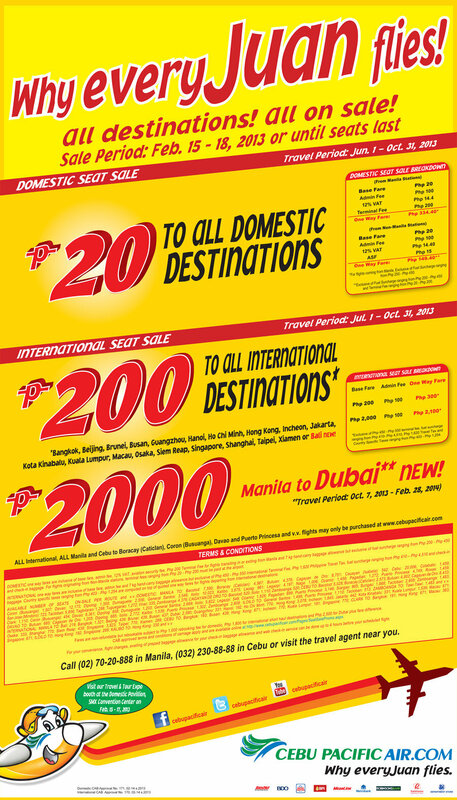 Promo fares are available until February 9, 2013 or until seats last. Please take note that the base fare mentioned here does not include fuel surcharge, terminal fee, taxes, admin fee and other miscellaneous charges. To avoid inconvenience please take time to read Cebu Pacific's terms and conditions attached in the purchased ticket. The stay period for this promo is from June 1 to July 31, 2013. Tickets can be purchased online at www.gohotels.com.ph . Please contact Go Hotels for other ways to book their rooms. Below are their contact numbers. 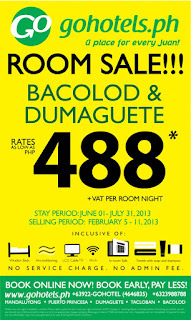 The promo can be availed from February 5 to 11, 2013 or until promo rooms were sold out. Philippine Airlines (PAL), Asia's first airline announces a promo! The seat sale promo offers all-in fares as low as 1200 Pesos. Among the destinations included were Cebu, Laoag, Iloilo, Kalibo and many more. For more details, please check PAL's promo page. Both economy and business class seats are on sale. The travel period is from June 17–October 15 2013. Tickets can be purchased online at www.philippineairlines.com or their ticketing office. You can pay it online either using your credit card or reserve and pay later at the nearest 7-Eleven stores. Tickets are available for purchase from February 5 to 9, 2013 or until seats last, whichever comes first. As mentioned earlier, this promo offers as low as 1200 Pesos all-in fares. All-in fare already includes the base fare, taxes, surcharges, ASF, terminal fee and other miscellaneous charges. Please check the terms of service document attached to the ticket in order to avoid inconveniences along the way. 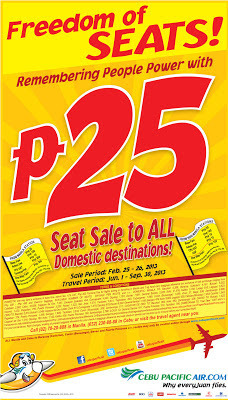 Low-cost airline Cebu Pacific announces today a new seat sale promo for both domestic and international destinations. The seat sale promo slashes down domestic base fares to as low as 288 Pesos only. Destinations includes Manila to Cebu, Tagbilaran, Tuguegarao, Caticlan (Boracay), and Tacloban. International destinations on the other hand includes Bangkok, Hong Kong, Singapore and Kuala Lumpur. For the complete list of promo destinations, check out Cebu Pacific's promo page. The travel period for this promo is from February 15 to April 3, 2013 for domestic and March 15 to June 30, 2013 for international. Tickets can be purchased online at www.cebupacificair.com or at their ticketing office. Tickets must be purchased before February 6 or until seats last, whichever comes first. You can contact Cebu Pacific at their hotlines: (02) 70-20-888 in Manila, (032) 230-88-88 in Cebu. Please be reminded that base fare is exclusive of baggage, taxes, terminal fee, fuel surcharge and other miscellaneous fees. Always check the final amount before continuing the purchase. Also, make sure that the names of the passengers are correct. Spelling errors can cause a lot of inconvenience. Cebu Pacific is the largest airline company in the country flying over 13 Million passengers last year. They operate in a low-cost airline model and is a leader in offering low fares through their seat sale promos. They currently serve 33 domestic and 20 international destinations. They offer the youngest fleet of aircraft in the region. 1. If you frequently travel to a place like your home town, why not leave things there like a few clothes, shoes, toothbrush etc, so the next time you travel, you don't need to bring those things over and over again. 2. Prepare a checklist. Preparing a check list will enable you to have a better view of all the things that you are about to bring. Having a checklist can help you evaluate what are really needed and what can be left behind. 3. If it is possible, bring pasalubongs or "presents" that are light. Dry items are preferable. 4. If you plan of buying a bag, make sure that it is light when empty. There are some bags that are already 5 kilos even if it's still empty. 5. If possible, choose the lighter option regarding which things to bring: pants, jacket, shoes etc. Remember, airlines allows up to 7 kilos of hand-carried bags. Make sure to utilize this provision whenever possible.